Most of our planet is covered by over 200 m (over 650 ft, almost two football fields long) of water, making the deep sea the largest habitat on Earth. The average depth of our oceans is 2.3 miles (3688 m) deep and the deepest point is over 36,000 feet (11,000 m) below the surface. Even though the deep sea makes up the majority of our planet, the environment is remarkably different from what we tend to think of as a hospitable habitat. The majority of sunlight cannot penetrate the ocean into the waters of the deep sea, so the waters are either very poorly lit (between about 200 – 1000 m) or entirely devoid of sunlight (below 1000 m). These waters are also near freezing and the pressure is so great that humans cannot dive to these depths without the protection of specially designed submarines. With all of these factors, it is no wonder why early scientists believed it was impossible for animals to live in the deep sea. Surprisingly, life has found a way to not only survive these conditions, but to thrive in this extreme environment. Yet, these physical factors greatly affect our ability to explore and study the deep sea and animals living there. Instruments that work at the surface may crumble under the immense pressures or freeze in the cold waters, and we cannot simply keep a deep sea fish alive in a tank to study its biology like we can for shallow water animals. Luckily advances in technology have made it much easier to study this mysterious environment over the past few decades. Here are a few of the powerhouses behind recent advances in deep-sea research. 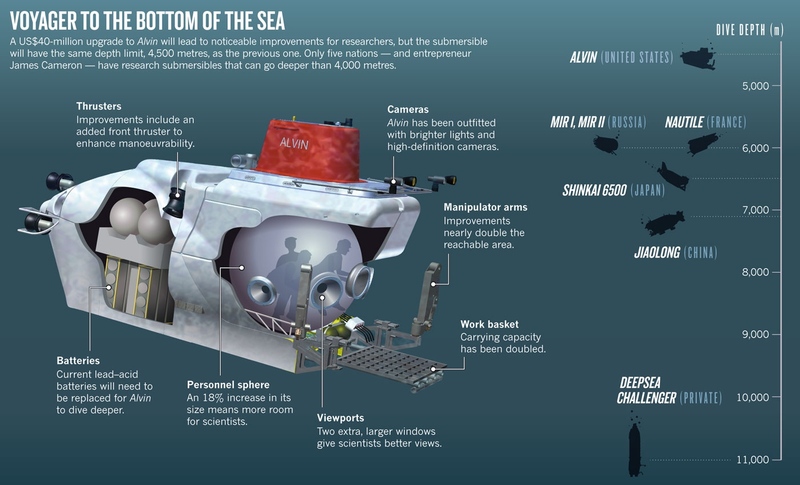 An illustration of the Alvin submersible and its components. To the right, the maximum depth of different submersibles. Image illustrated by Megan Carroll. © WHOI. Submersibles are essentially small submarines. These vehicles are designed to take a few passengers down to the depths of the ocean. Usually submersibles only hold 1 – 3 people and have a few windows the pilot and observers can use to peer out into the environment. Submersibles are battery operated and usually connected to a ship for some basic communication with the surface. Today, submersibles usually have some large cameras that can send video of the ocean’s depths back to the surface. In addition, most submersibles have manipulator arms that the pilot can use to collect samples (rocks, animals, artifacts, etc) and conduct research. There are some drawbacks to conducting research with a submersible, however. Because these vehicles rely on battery power and are manned by humans sitting inside a very small space (without a bathroom or a kitchen), submersibles can only stay submerged for a limited time. With the exception of Deep Sea Challenger, which James Cameron took down to the deepest point in the ocean, submersibles tend to have relatively shallow working depths. NOAA’s Mir I and Mir II remain some of the deepest diving submersibles, capable of descending to depths of 6,000 m (that’s about 19,600 feet). Another notable submersible is NOAA’s Alvin, which was used in the discovery of hydrothermal vents in 1977 and to document the RMS Titanic wreckage in 1986. Scientists have been able to get around some of the depth and time constraints of using submersibles by working with smaller vehicles that do not carry human passengers. These are called remotely operated vehicles, or ROVs. ROVs are connected to a ship with a long fiber optic cable that is used to control the vehicle from the surface. ROVs are equipped with cameras that guide pilots and allow scientists to “see” the ocean’s depths with only a split second delay. Many ROVs are also specialized for research, carrying several sensors and manipulator arms that pilots control (with what looks like a video game joy stick) to collect different types of samples. Because there are no humans inside an ROV, most of these vehicles can go to greater depths than submersibles. Furthermore, most ROVs receive all of their power from their connection to the ship, allowing them to stay down indefinitely (or at least until the ship runs out of supplies). Another large problem with submersibles and ROVs is that they require a larger ship to support their operations. Running a ship is expensive when you think of the cost of supplies, fuel, and the crew. Furthermore, submersibles and ROVs do not move quickly or traverse large distances. Both of these factors make the vehicles a little impractical for some scientific questions. Fortunately, science has made great strides in the design of several classes of autonomous underwater vehicles or AUVs. These are much smaller (often torpedo-shaped) vehicles that glide (or drift) through the oceans collecting different types of data (such as water temperature, depth, chlorophyll concentrations, salinity, etc.). AUVs are not tethered to a ship and rely on their programing to guide their missions. Once they are launched, scientists have limited control over them. Some AUVs can communicate briefly to shore and respond to slight alterations in programming (altering course or depth guidelines) or “come home” when given the signal from scientists. Most AUVs cannot collect heavy payloads, limiting their ability to take samples. But some AUVs are equipped with cameras so scientists can collect imagery of different locations. AUVs are battery operated like submersibles so they cannot stay at sea forever but can be deployed for days or months at a time depending on the design. Scientists are working on ways to recharge AUVs while they are deployed to avoid these time constraints. Before the development of these submersibles, ROVs, and AUVs, scientists relied on more analog methods of data collection such as sending nets and niskin bottles down to collect animals and water samples, respectively. These techniques are still used today and are still valuable research tools, however the development of submersibles, ROVs, and AUVs has allowed scientists to cover more ground, and has revolutionized how scientists view the deep sea. For instance, AUVs have been used to find fish acoustically and map deep reefs. ROV dives have also allowed scientists to discover and classify new species (1), have led to scientists realizing that many species live in different areas or at greater depths than previously recognized (2), have given valuable insight into behaviors of many animals, and have led to new understandings about some basic biological information. For example, these dives taught us that 75% of marine organisms are bioluminescent (i.e. produce their own light,3)! Scientists have even partnered with industry to use some of the commercial vehicles that are used to monitor deep-sea oil drilling rigs, for instance, to get a better understanding of some more enigmatic deep-sea organisms or to answer questions about how deep-sea communities respond to human induced changes to their environment (4). Scientists aren’t the only people who find these questions interesting, and thankfully, there has been a recent push to make deep-sea research available to non-scientific audiences. NOAA’s Office of Exploration has teamed with scientists to explore the deep sea using ROVs and live streams all of their scientific dives for viewers to watch. You can tune in to the live feeds of the Okeanos Explorer and Nautilus to see science happening in real time. For a more hands-on approach, there are several organizations working on deep-sea ecotourism, taking people down in submersibles to witness the wonders of the deep for themselves. Finally, while you may not be able to go into the deep-sea, several companies (such as Open ROV and GNOM) market smaller ROVs that you can take out on a lake or with your kayak to explore on your own! Quattrini, A. M., Demopoulos, A. W. J., Singer, R., Roa-varon, A., & Chaytor, D. (2017). Demersal fi sh assemblages on seamounts and other rugged features in the northeastern Caribbean, (January).